Flipping your car over usually translates to a very bad day, but this upside-down truck is actually a kind-of-enviable mode of transport. The truck was built by mechanic Rick Sullivan over the course of six months. He says the build only cost him $6,000, which seems like a bargain. 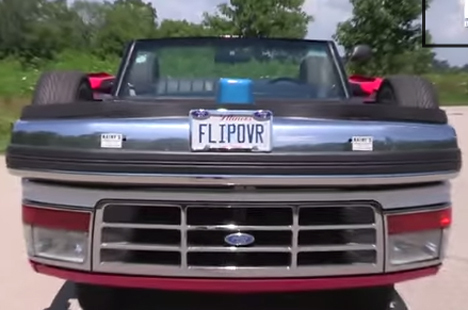 The crazy spectacle started out as a Ford Ranger and a Ford F-150. 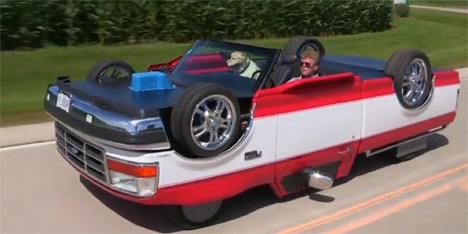 The Ranger became the “guts” of the truck and the body of the F-150 was placed on top, upside-down. When the truck is moving, its top tires spin as though they’re helping to propel the vehicle along. Although Sullivan gets plenty of attention while riding around in his wacky truck, he says he’ll never sell it. 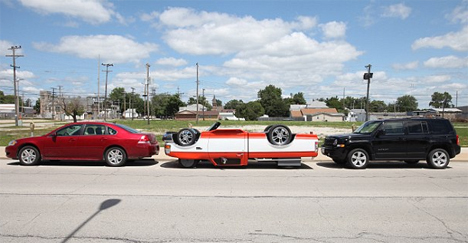 See more in Art Vehicles or under Transportation. November, 2014.